Frida and I go way back. When I was a young ‘un in art school, my roomates and best friend teamed up to gift me a book or two from the local book store, and one of them was the Diary of Frida Kahlo: An Intimate Portrait. My friends had said that if it wasn’t my cup of tea, I could exchange it. Well, being more into fantasy and figural art at the time, and not yet having gained an appreciation for more modern artists, I decided to do something unprecedented for me, something I had never done before: I exchanged the gift for two books of two artists I DID know: Egon Schiele (maybe NSFW) and Boris Vallejo. And I always felt guilty about it. Later, I took a course in 20th century art, and while it wasn’t always my cup of tea, I began to gain a much stronger appreciation for the “why” of modern work, and even later still, for women in art—bold women who didn’t just paint flowing, pastel things, but who painted strange and thought-provokingly surreal images. Of course, I saw the movie Frida, with Salma Hayek. Of course, I loved it. Fast-forward: Years later, all kinds of random things happened. Fast-forward a little more. Years later, we had a daughter. 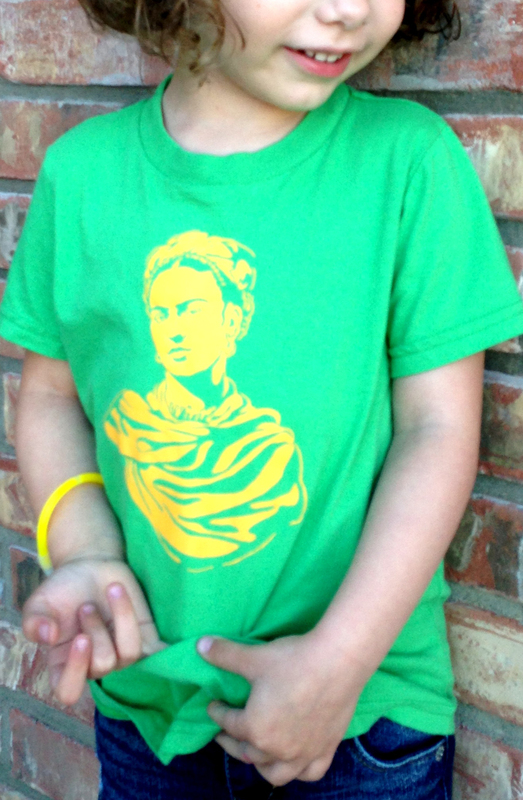 A little farther: Years later, out of the blue, my sister-in-law got our daughter a little Frida shirt for her 4th birthday. It was like seeing an old friend! Involved with everyday things as well as discovering our daughter’s artistic side, I had forgotten all about Frida. Our daughter was excited to know who it was on this new shirt. I told her excitedly, “It’s an ARTIST!” She said, “a GIRL one like me and you?” and her excitement was clear: there was another girl, like me and like her, that love love LOVED to draw and paint. 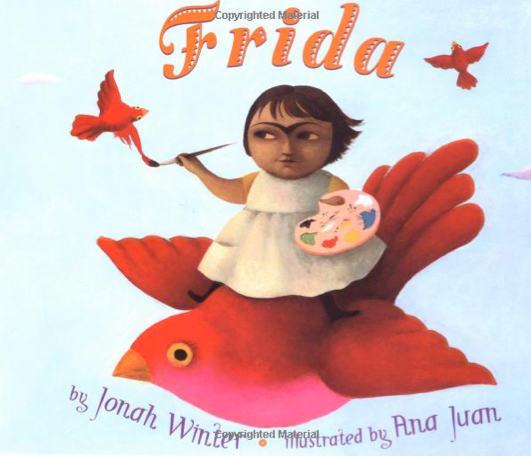 I remembered that there was a children’s book on Frida. We got it, and she loved it. The beautiful, simple paintings, the easily-told story. Just a wonderful introduction to an artist, told in a simple way that a kid could understand. 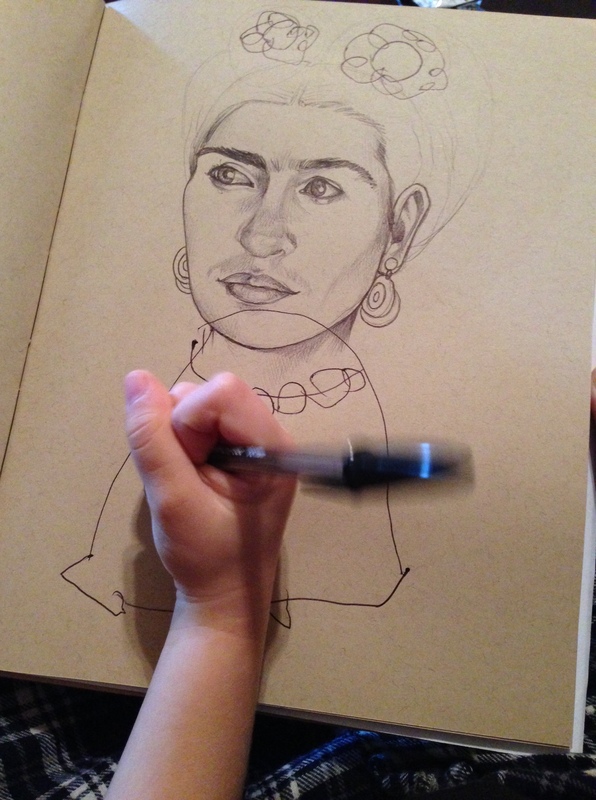 When our little collaborations became a regular thing, I decided one day to draw Frida in my sketchbook. Since she was familiar with her, I wondered what she would do. I showed her a picture of how the real Frida looked and how she dressed. She studied it carefully, and began to draw, adding squiggly flowers in her hair and on her dress. When she started adding on to her arms, I asked her what she was drawing. “Paintbrushes,” she said. “She’s painting.” And that made me smile. She’s had a fondness for Frida since that shirt first came. It was a great opportunity to teach her about other artists. 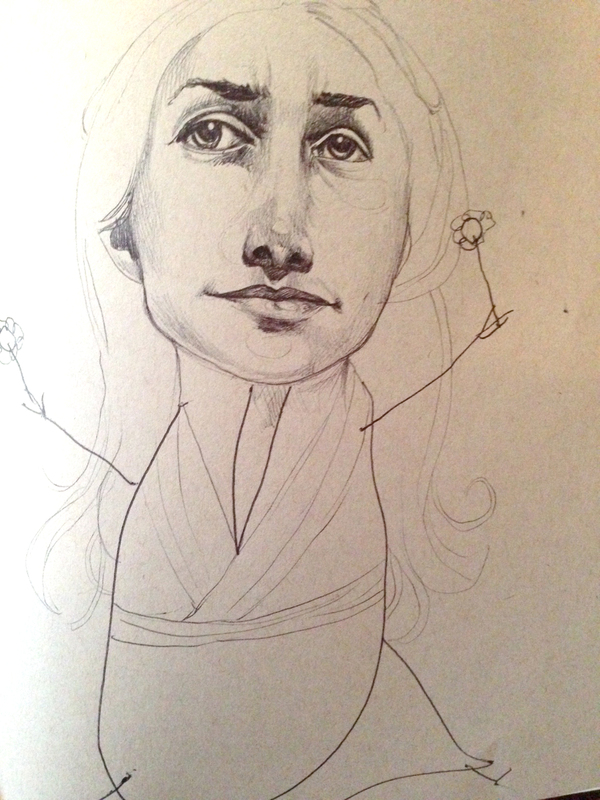 The other day, I doodled Georgia O’Keefe, just for giggles. I told her a little about how Georgia was an artist who loved to draw flowers. (FLOWERS, people!!) So she drew her with flowers in her hands. She wasn’t quite as interested in Georgia (admittedly, neither am I), but maybe now we’ll make this a fun little habit. It may be a good way to teach her about other artists and why they were such a big deal. 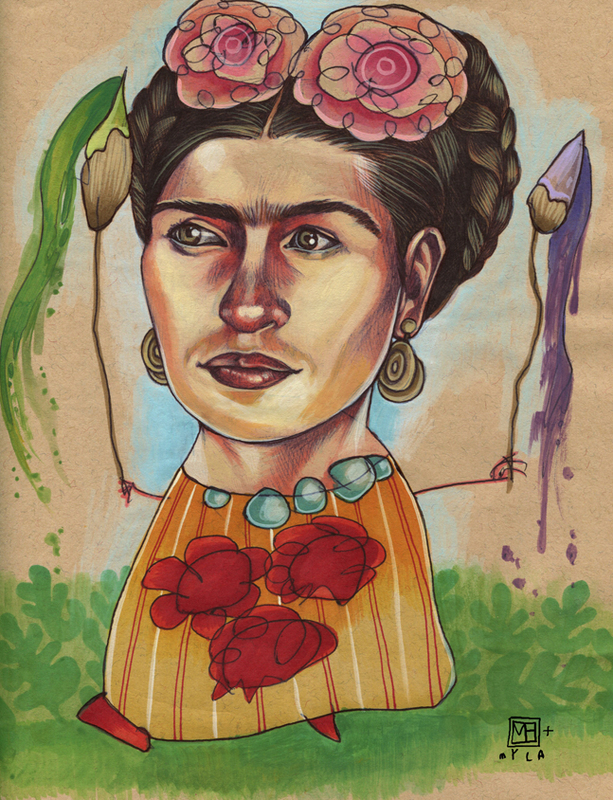 If you want a little Frida for yo’self, I put FRIDA PRINTS up at Society6. I think I may need a mug of my own…. UPDATE: I did a step-by-step walkthrough of Frida with Paintbrushes for Jerry’s Artarama. Check it out! Thank you, thank you, thank you! What a fun blog to pop into my inbox while I am just reading my mail. I love your daughter’s enthusiasm, and also how some people (Frida in this case) weave their way into our lives not of our own doing. I just discovered your work on Society 6 yesterday and while reading was hoping you would put this drawing there, then I got to the bottom, and voila, wish granted! I love this post! I love all of your work together but I think it’s especially endearing to see you working together to honor other women artists! I think Frida is now my new favorite! Glad to see you continuing your collaborations. Thank you! It’s fun to try new things with her, especially when it teaches her new things! Yikes! I’m not sure what to tell you–they’re a seperate business; you’d have to contact them directly. Sorry! Hey there! I’ve been following this project with your daughter. I love happy accidents in art. I used to draw with my mom when I was little, it was the best! We never struck on quite the same collaborative note that you two have found, but it was my favorite thing about spending time together. Tell your daughter I send out art postcards to friends and clients a few times a year. I’d be happy to put one in the mail to her from another artist. A Girl one. . Happy drawing, painting and art making! I love that Frida book! Do you have any other books for your daughter about artists that you would recommend? Hi there, thanks! I sure wish I did–Frida’s the best I’ve seen; cute and simple. Still, maybe there’s room for Myla & I to make our own! I love Frida and what another amazing collaboration! I, of course, ordered the print and a few others as well to add to my collection. I love Frida!!! I didn’t become properly acquainted with her work until an Art History class in Undergrad. My professor was very eccentric and spent a lot of time on her. I fell in love. From the bizarre self-portraits to her obsession with the polluted world – I can’t get enough!! i love all your collaborations! your little one is crazy talented! i’ve been trying to get our son to collaborate with his father and i and he’s just so stubborn…his art is his art hahaa! great work! love it all!! You and your daughter are amazing. You’re an inspiration. I used to do art and feel scared to go back, thinking that I will fail. I have a four year old who loves to draw and paint. She’s never seen mommy do it and it makes me somewhat sad. Anyway, you’ve inspired me to pull out my supplies. Also, you are a great writer!! I love reading your blog for multiple reasons. Thanks mom! Oh thank you so much! So good to hear. Yes, definitely get those supplies out, if it’s something you love! This is amazing! Will the Frida print become available in the store? I didn’t care much for Georgia O’Keefe until I saw her New Mexico desert landscapes… now THOSE are truly spectacular! I admit though, I’m from the desert too, so maybe it just speaks to me a bit more than most. The two of you should sit and look through those, maybe (just maybe) you can fall a bit more in love with another artist.